Having a backyard swimming pool is one of the best ways to get the most out of your home. In the summertime, your backyard swimming pool can serve as the social center of the entire neighborhood, and as children, neighbors, and family members relax in your clean, safe pool. But pools can also be dangerous, especially if there are young children living in your home or visiting. 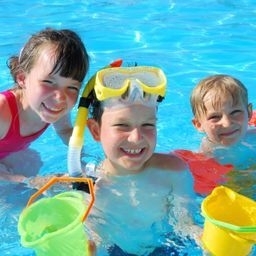 It’s important that you supervise children whenever they are in or near your pool. It’s also a good idea to provide a barrier such as a fence or lockable deck to keep children out of your pool when you aren’t there to watch them. At Eagle Pools, our highly skilled, experienced pool technicians can ensure that your pool is always safe for people to swim in. We will keep your pool clean, balance the chemicals that prevent bacteria and algae from growing, and ensure that your pool equipment is always working properly. But we can’t always be there to prevent children from swimming in your pool without supervision. That’s going to be up to you. Everybody loves spending time in the pool, especially when the weather is hot and sunny. But the pool isn’t safe for people who can’t swim or who are too young to watch out for themselves. Protecting your pool with a fence and always providing supervision for children using your pool is the best way to protect both your guests and you. The last thing you want is for an accident to occur in your swimming pool. So take the extra steps to provide the kind of protection your friends, family, and neighbors deserve. When not in use, keep your pool locked and safe. And always supervise children playing in your pool.